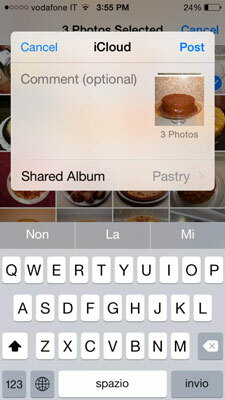 Tap the Shared button at the bottom of the screen to open iCloud Photo Sharing, which displays a list of shared albums. The first item in the list, Activity, shows the history of photos and comments that were posted to the shared albums. Tap the plus sign in the upper left or New Shared Album at the bottom of the list. A dialog opens and the keyboard appears on screen. Type a name for your new shared album, and then tap Next. Tap Create without selecting people you want to share the album with. Tap the To field and type the email address of the person you want to invite to view your photos, or tap the Add button (it looks like a plus sign) to access your Contacts and choose recipients from there. Repeat Step 2 to add more recipients, and then tap Create. Your new album is added to the iCloud Photo Sharing list. Tap the album to add photos. Tap the Add Photos button (the plus sign). Thumbnail images of the Moments in Photos opens. Tap the Shared or Albums buttons in the Browse bar to choose photos from a different location. Tap the photos you want to add to that album. Type a message if you want, and then tap Post. The photos are added to the shared album on iCloud Photo Sharing and anyone allowed to see the photos is notified.